Matthew Apgar - mapgar@shawmedia.com Peewee hockey players with the Crystal Ice House Yellow Jacket in-house teams exit the rink after competing against each other on Sunday, Feb. 21, 2016 at Crystal Ice House in Crystal Lake. 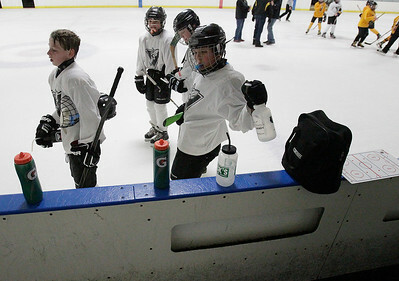 The peewee teams practice and compete once per week to learn more about the sport of hockey and to prepare them for the next level of competition. 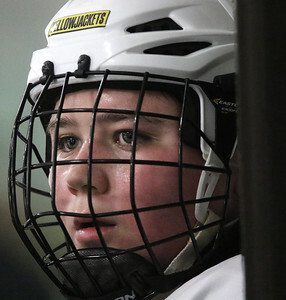 Matthew Apgar - mapgar@shawmedia.com Colin Friedman watches from the during a game pitting two peewee Yellow Jacket in-house teams against each other on Sunday, Feb. 21, 2016 at Crystal Ice House in Crystal Lake. The peewee teams practice and compete once per week to learn more about the sport of hockey and to prepare them for the next level of competition. 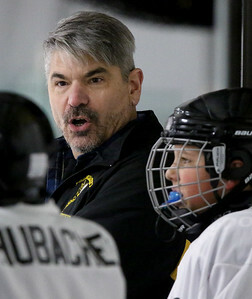 Matthew Apgar - mapgar@shawmedia.com Yellow Jacket peewee hockey coach Jerry Marzejon talks with his players during a game against another Yellow Jacket in-house team on Sunday, Feb. 21, 2016 at Crystal Ice House in Crystal Lake. The peewee teams practice and compete once per week to learn more about the sport of hockey and to prepare them for the next level of competition. Matthew Apgar - mapgar@shawmedia.com Justin Tapio exits the ice as John Schumacher, right, prepares to take his place during a game pitting two peewee Yellow Jacket in-house teams against each other on Sunday, Feb. 21, 2016 at Crystal Ice House in Crystal Lake. The peewee teams practice and compete once per week to learn more about the sport of hockey and to prepare them for the next level of competition. 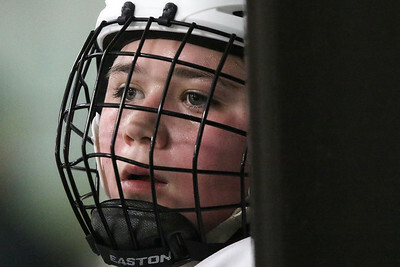 Matthew Apgar - mapgar@shawmedia.com Colin Friedman looks up at coach Jerry Marzejon during a game pitting two peewee Yellow Jacket in-house teams against each other on Sunday, Feb. 21, 2016 at Crystal Ice House in Crystal Lake. The peewee teams practice and compete once per week to learn more about the sport of hockey and to prepare them for the next level of competition. 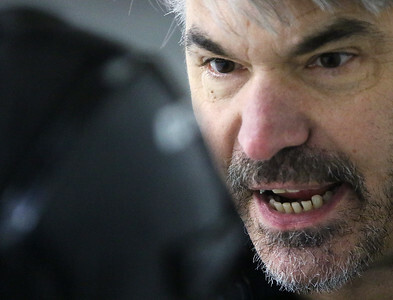 Yellow Jacket peewee hockey coach Jerry Marzejon talks with his players during a game against another Yellow Jacket in-house team on Sunday, Feb. 21, 2016 at Crystal Ice House in Crystal Lake. The peewee teams practice and compete once per week to learn more about the sport of hockey and to prepare them for the next level of competition.